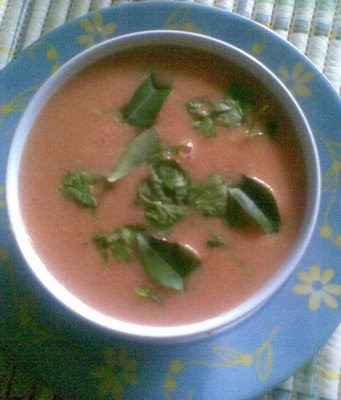 Carrot-Beetroot juice is one of the highly nutritious drinks. This drink is exceptionally high in vitamin A, minerals, and other nutrients. The rich color comes from the combination of carrot and beetroot. The color of this juice is what catches the eye first. 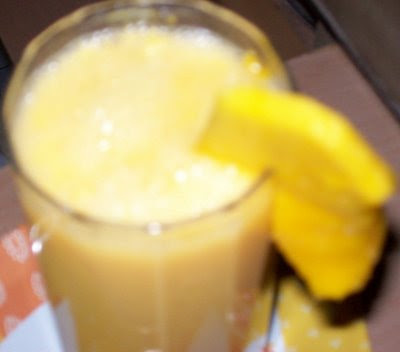 It has a nice frisky taste to it as it has just the right flavor of tang and sweetness. Honey-1 tsp(Optional) or Pinch of salt or sugar as per taste. Peel both beetroot as well as carrots and chop them into slices after washing them. Dice the fruits and vegetables into a size that is comfortable for the mixer/juicer. Add the mint leaves, Honey or Pinch of salt or sugar and ginger. Add a little water to make it thinner. 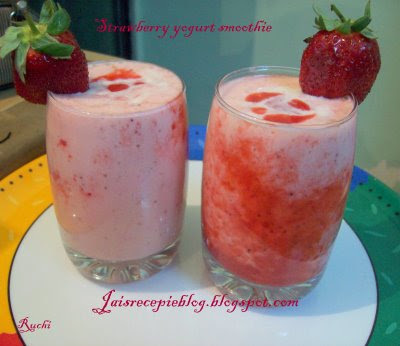 Combine all ingredients in a blender and make puree. Take the juice in a glass and garnish with mint leaves. 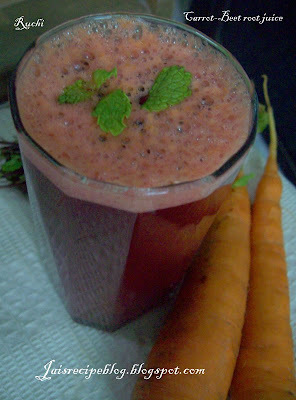 Healthy and Delicious Carrot-Beetroot juice is ready to serve. 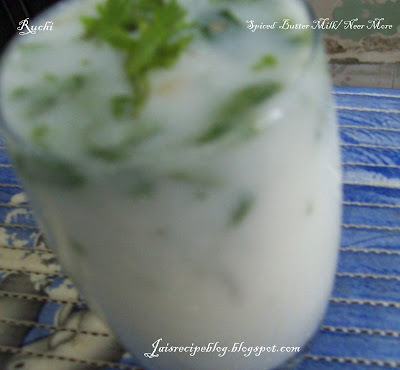 Spiced Buttermilk is a soothing combination of fresh home made curds,water,fresh curry leaves,crushed ginger,green chillis,salt and a dash of lemon juice. This spice and herb infused drink is a perfect blend of multitude flavors and increases our appetite and digestive power. Churn the curd. Add about 2 to 3 cups of water. Churn briefly. 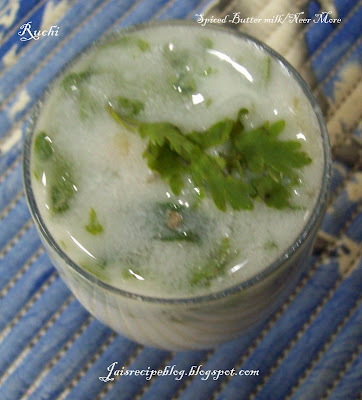 Wash green chillies and fresh coriander leaves, wash and peel ginger. Chop all the three ingredients finely. Pound curry leaves with required quantity of salt. Add the prepared ingredients to churned yogurt. 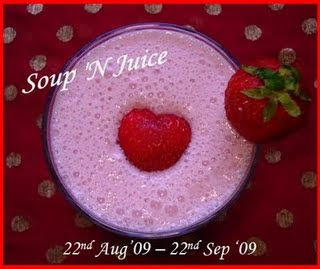 Iam sending all these entries to Sireesha's "Soup 'N Juice"Event. omg so mny ,,,spiced butter milk looks yum,,. 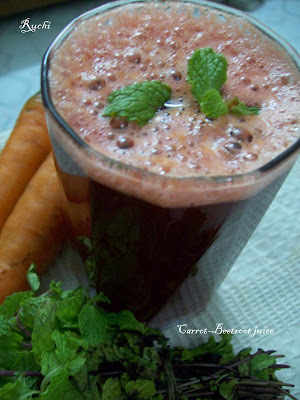 Omg, that beets-carrot juice looks gorgeous, wat a vibrant colour...Refreshing neer more, prefect entries Akka.. Absolutely refreshing drinks. Superb collection for the event. Everything looks so good. I will try the carrot-beetroot juice...it is so nutritious. Beet and carrot juice.... wow what a helthy juice nice color too great choice of entries.